One problem faced by responsible gun owners who own more than one handgun is finding a safe of an appropriate size. Most of the gun safes advertised are for one weapon, or they are too large to be discreetly housed in a home or office setting. If you are looking to secure no more than a couple of handguns, then the GV2000S is worth considering. 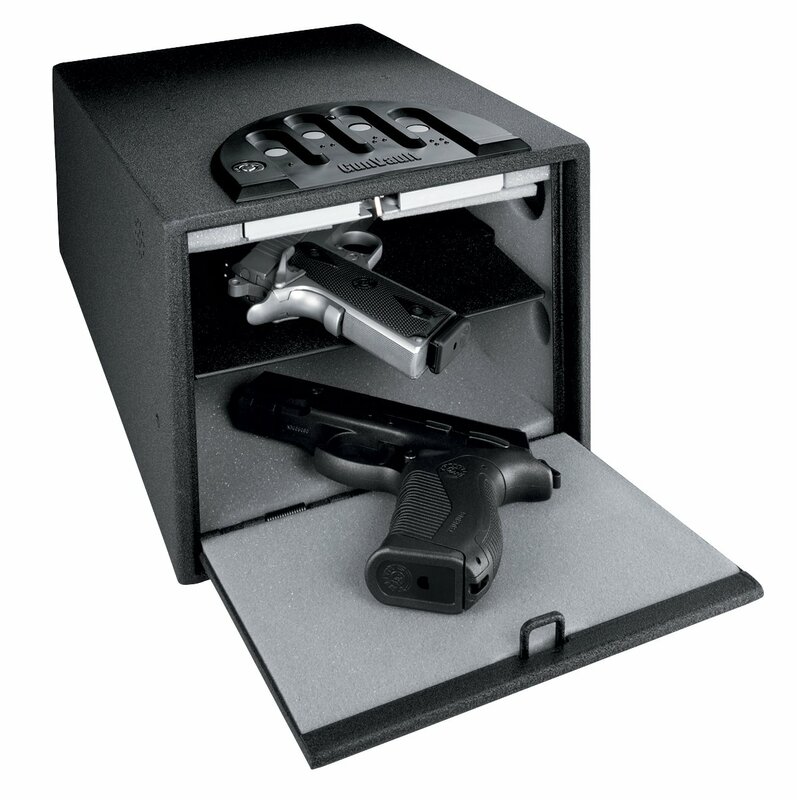 At 8.2” x 15” x 10.5” this two-shelved safe is compact but will hold two medium-sized handguns and accessories such as extra magazines. Alternatively, it could be used for one gun on one shelf and some small valuables or important documents on the other. The design is a little unusual in that the safe is taller at the front than at the back, so this cuts down on the storage space a little, but not to any great extent. The interior surfaces are foam padded to prevent damage to the contents, and the shelf can be removed if you want to store something larger than a gun. Unfortunately, the position of the shelf is not adjustable, but in a safe of this size I don’t believe this is a huge disadvantage. Because the door is on the front, this safe is ideal for fixing to the floor, or to a shelf or nightstand using the supplied templates and hardware. This is advisable because, at an empty weight of 14lbs, the safe could easily be carried off. And if you are looking for additional security, there are a couple of knockout tabs on the safe that would allow you to attach a security cable, but the cable would have to be purchased separately. The 16-gauge steel from which the safe is made would deter most opportunistic thieves, and the high-strength lock and spring-loaded door mechanism are activated using an electronic, 4-button combination system that has 12 million possible codes for you to choose from. Programming your personal code is easy if you follow the supplied instructions which are clearly written, and the molding around the rubber buttons helps you enter your code without looking, or in the dark. With a little practice entering your code without looking becomes second nature. Two override keys come with the safe for cases of battery or keypad failure, and multiple sound and visual warnings will alert you to events such as low battery and repeated attempts to enter the wrong code. Many buyers absolutely love this product, but as with this type of product there are complaints regarding battery life and keypad failure. Most of the instances of keypad failure seem to appear after approximately a year, so these are complaints that I can neither confirm nor deny. As with most of these products, this safe may not survive a determined assault with power tools, but your little ones or opportunistic sneak-thieves are not likely to get to your gun. Also, complaints of keypad failure are a concern—nobody wants the keypad to fail in an emergency—but this is a risk that you run with any sort of electronic system and is no more frequent in this safe than in similar products. However, access is quick and easy, and this safe seems to fill the need for a compact safe that will hold more than one gun nicely. And it is definitely affordable.